How to watch The Homesman (2014) on Netflix Argentina! Sorry, The Homesman is not available on Argentine Netflix, but you can unlock it right now in Argentina and start watching! With a few simple steps you can change your Netflix region to a country like USA and start watching American Netflix, which includes The Homesman. We'll keep checking Netflix Argentina for The Homesman, and this page will be updated with any changes. The Homesman is not available in Argentina BUT it can be unlocked and viewed! A pious pioneer woman enlists a drifter to help her transport three women driven mad by harsh frontier life across the Nebraska Territories to Iowa. She's prim and proper. He's a sleazy opportunist. But they've got to work together to save three traumatized women. There is a way to watch The Homesman in Argentina, even though it isn't currently available on Netflix locally. What you need is a system that lets you change your Netflix country. 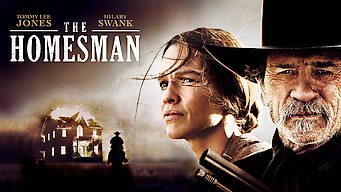 With a few simple steps you can be watching The Homesman and thousands of other titles!